This show stopping dessert is called “firewood under snow” in Russian – Дрова Под Снегом. It’s unconventional and unique but is so appealing in simplicity. 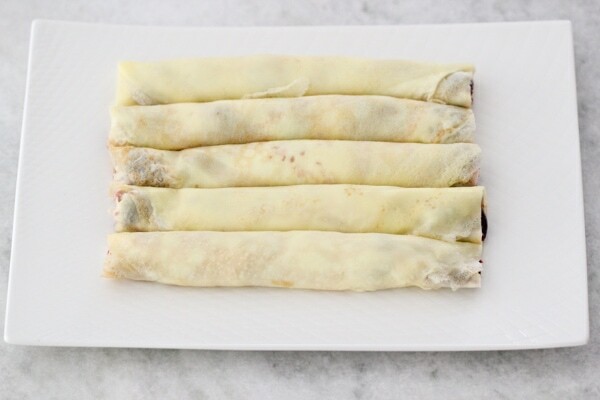 The juicy and flavorful cherries are rolled in layers of thin, dainty crepes. That would be delicious enough as it is, but when it’s assembled as a cake and saturated with smooth and refreshing frosting that is silky in texture, it looks phenomenal and is surprisingly tender and delectable. The actual crepe batter is the best one I’ve ever worked with. It’s my favorite go-to crepe recipe hands down. Since my Mom doesn’t have a written recipe for her crepes, she just eyeballs everything while she’s mixing it up, it took me many attempts to finally get the recipe down pat so that it would work out perfectly every time. It was worth it, though. 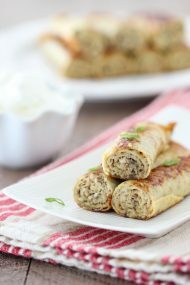 The crepes are thin and have an incredibly tender texture. Surprisingly enough, they are stretchy and don’t break when you’re flipping them. I’m convinced that it’s the combination of both cornstarch and flour in the batter. Also, another thing that I love about this recipe is that you don’t have to chill the crepe batter before making the crepes. Most recipes for crepes require at least 30 minutes of chilling before they are workable, but not this one. You can really adjust the recipe to your taste preferences. The cherry filling is really delicious, cooked with some red wine and cinnamon, but you can make it really easy on yourself and use store bought cherry pie filling, or use other flavors, such as strawberry, raspberry or peach pie filling. You can even use canned fruit instead of pie filling. Whisk all the ingredients for the crepe batter in a bowl or use a blender to combine them all together. Melt 1/2 tablespoon of butter in a nonstick skillet on medium high heat. You can use a 10 or 12 inch nonstick skillet. 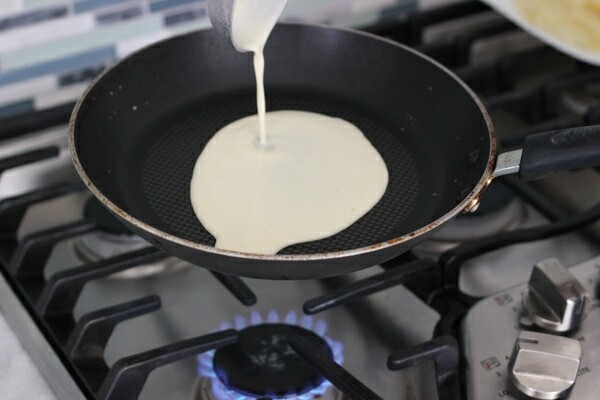 Pour in a little less than 1/4 cup batter, tilting the skillet to distribute the batter over the surface of the skillet. Heat until lightly golden, 1-2 minutes, flip and cook for about 30 seconds. Cook all the crepes and set aside. 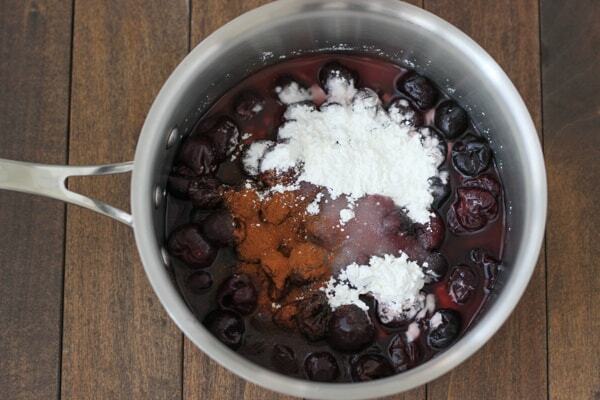 Meanwhile, combine all the ingredients for the cherry sauce in a small saucepan. Make sure to dissolve the cornstarch before you start cooking it. Bring to a boil, reduce heat to low and cook for 5-10 minutes, just until the sauce thickens. Drain all the syrup. (Save it and pour over ice cream, pancakes or french toast. Absolutely delicious!) Set aside to cool. 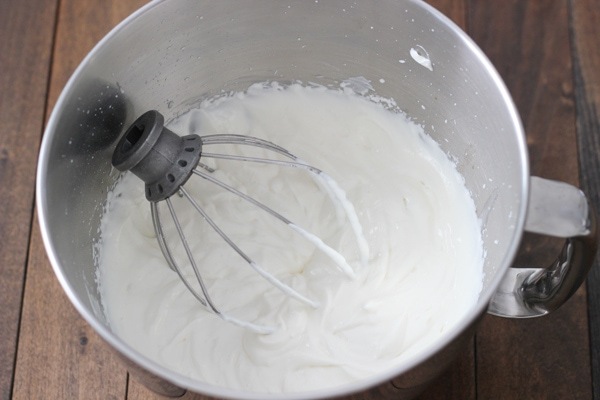 To make the frosting, whisk the sour cream, sugar and vanilla until well combined in a chilled bowl using a standing mixer with a whisk attachment or using a hand held mixer. Pour in the cold heavy cream and whisk until the frosting thickens, 3-5 minutes. To assemble, spread a thin layer of frosting over the surface of each crepe. 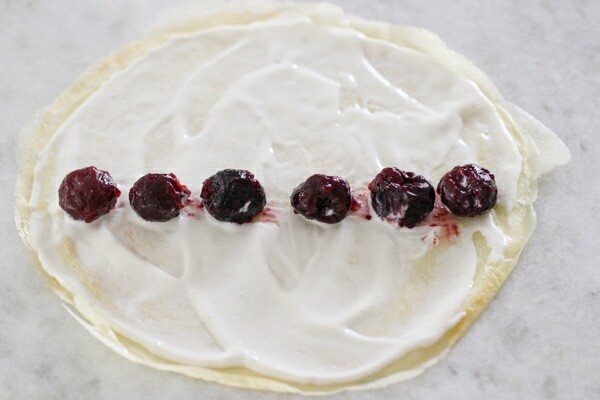 Place cherries in a line in the center of the crepe. Wrap the crepe around the cherries. 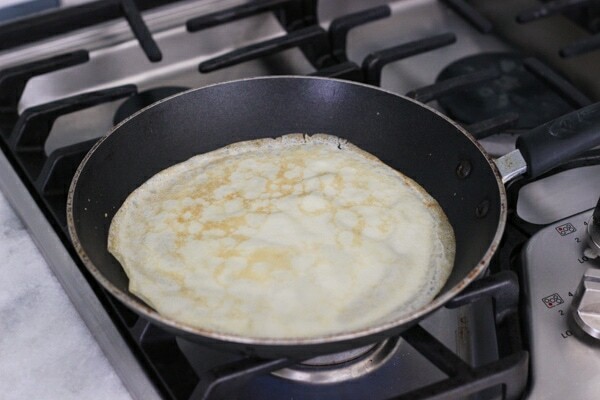 Trim off the edges of the crepes to make them a little neater. Repeat with all the crepes. Place 5 filled crepes side by side on your serving plate. Top with frosting. Place 4 more crepes on top with more frosting. Continue assembling cake each time with one less crepe until you are left with one crepe at the top, forming a triangle. 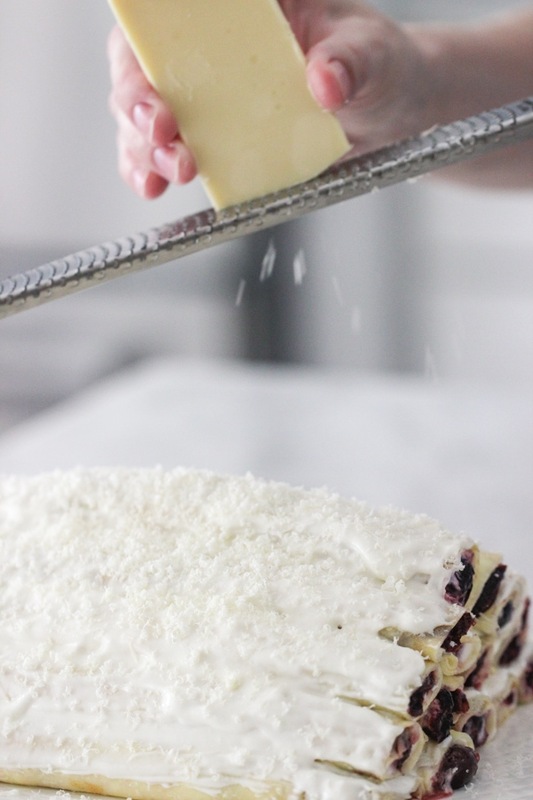 Grate some white chocolate over the cake. You can also use coconut flakes to get the snowy look. You are now looking at snow-covered firewood:). You should be able to have a few extra crepes, sauce and frosting, so you can make it a little bit bigger, if you’d like. This is just how it works out for the plate that I use for this recipe. 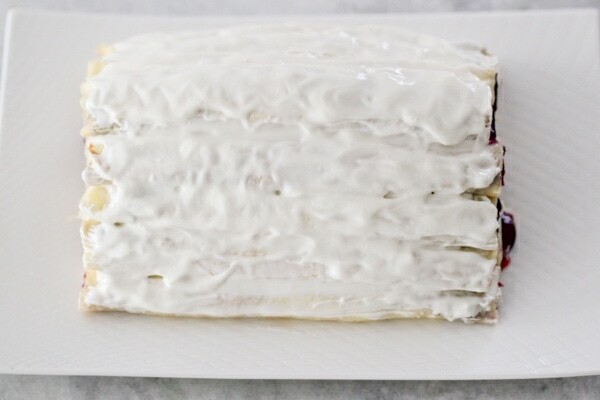 For a simpler presentation, you can place the cherry-filled crepes in a caserrole dish and top with frosting. Refrigerate for at least 30 minutes before serving. You can make this cake a day or two in advance and store it in the refrigerator, tightly sealed. To serve, cut it crosswise into wedges, and it will look kind of like a honeycomb, or serve it by “log”. I’ve done it both ways. 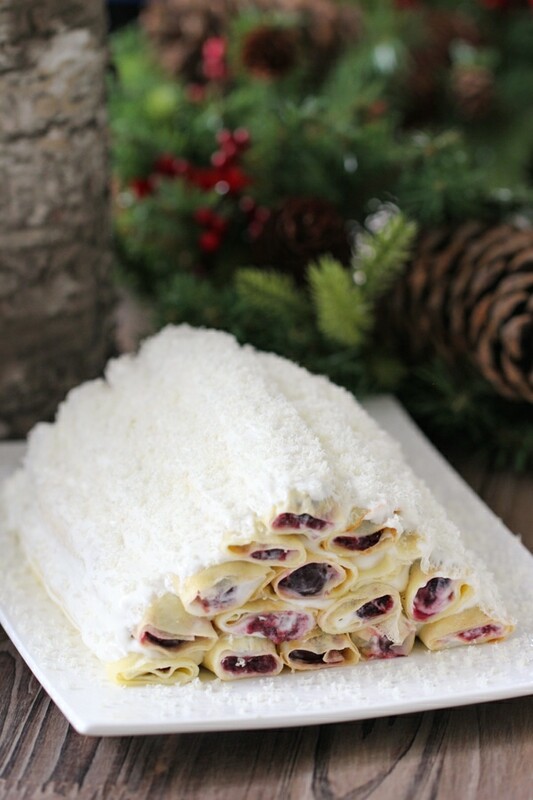 Cherry Crepe Cake - "Дрова Под Снегом"
Whisk all the ingredients for the crepe batter in a bowl or use a blender to combine them all together. Melt ½ tablespoon of butter in a nonstick skillet on medium high heat. You can use a 10 or 12 inch nonstick skillet. 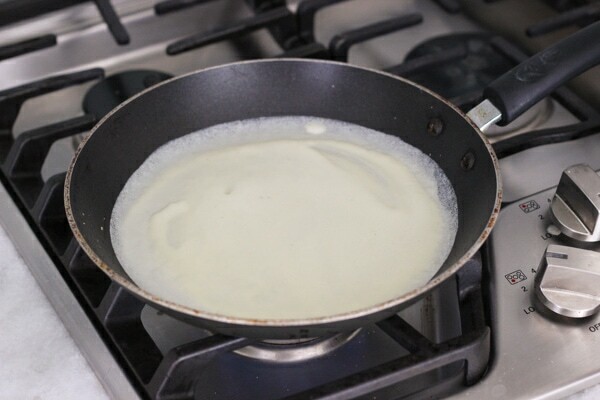 Pour in a little less than ¼ cup batter, tilting the skillet to distribute the batter over the surface of the skillet. Cook until lightly golden, 1-2 minutes, flip and cook for about 30 seconds on the second side. Cook all the crepes and set aside. Meanwhile, combine all the ingredients for the cherry sauce in a small saucepan. Make sure to dissolve the cornstarch before you start cooking it. Bring to a boil, reduce heat to low and cook for 5-10 minutes, just until the sauce thickens. Drain all the syrup. (Save it and pour over ice cream, pancakes or french toast. Absolutely delicious!) Set aside to cool. To make the frosting, whisk the sour cream, sugar and vanilla until well combined in a chilled bowl using a standing mixer with a whisk attachment or using a hand held mixer. Pour in the cold heavy cream and whisk until the frosting thickens, 3-5 minutes. 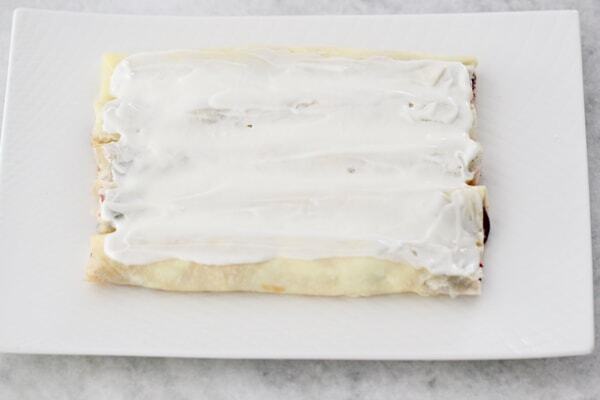 To assemble, spread a thin layer of frosting over the surface of the crepe. Place cherries in a line in the center of the crepe. Wrap the crepe around the cherries. 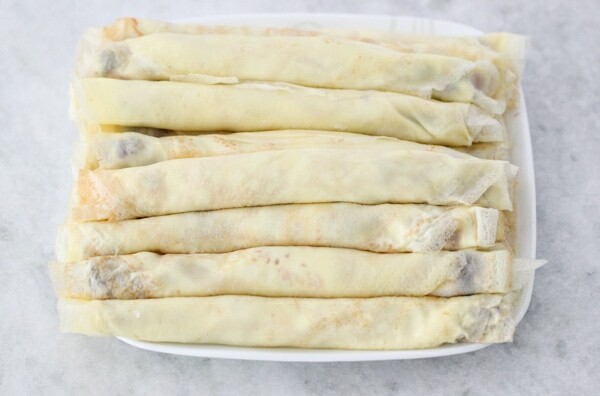 Trim off the edges of the crepes to make them a little neater. Repeat with all the crepes. Place 5 filled crepes side by side. Top with frosting. Place 4 more crepes on top with more frosting. Continue assembling cake each time with one less crepe until you are left with one crepe at the top, forming a triangle. You should be able to have a few extra crepes, sauce and frosting, so you can make it a little bit bigger, if you'd like. This is just how it works out for the plate that I use for this recipe. Grate some white chocolate over the cake. You can also use coconut flakes instead of the chocolate. You are now looking at snow-covered firewood:). 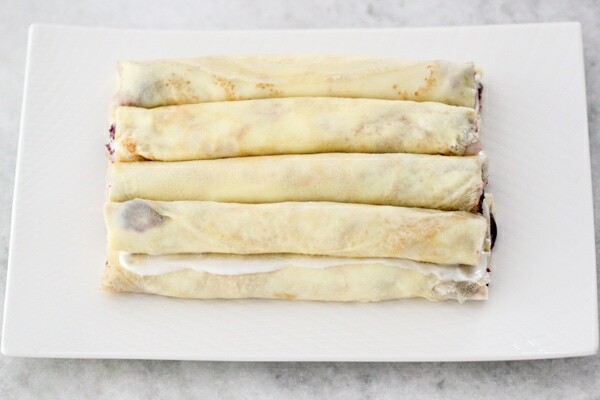 For a simpler presentation, you can place the cherry-filled crepes in a caserrole dish and top with frosting. Refrigerate for at least 30 minutes before serving. You can make this cake a day or two in advance and store it in the refrigerator, tightly sealed. To serve, cut it crosswise into wedges, and it will look kind of like a honeycomb, or serve it by "log". I've done it both ways. Why do you put starch in crepes? This Cake looks so good and easy to make! I’m making it right now! Hope mine comes out good as yours.. I love your site! Always checking whats new! Thank you for all these delicious recipes! God bless you! Julia, thank you so much for your kind words! I am so honored and touched whenever I hear from all of you wonderful readers. It feels more “real” and personal, not like I’m writing words into space but sharing recipes with others who enjoy them like our family does. Thank you:). Ani, I use canola oil. That’s the oil I use the most, it has a high smoking point and is very mild in taste. Olive oil is fine too, but I don’t usually use it for things like this, since it’s very flavorful. Olga whats kinda wine did you use? Any dry red wine will do; I like Cabernet Sauvignon, great taste and not expensive:). If I do not use wine in this recipe, will there be a big difference/effect? Maybe there’s a substitution? And instead of heavy cream, can I use whipping cream? I love your posts, made alot of your recipes and both me and my family loved them! Especially the rasberry cake! 🙂 God bless you and your family! If you don’t like cooking with wine, you can simple omit it. Of course, it will taste different but it will still taste great. I like cooking with wine because it adds such a depth of flavor. Another option is using canned cherry filling instead of making the cherry filling. I don’t really like the taste of canned cherries, so I choose to make this version, but if you do, that would be an easy substitute. You can use any kind of fruit that you like, peaches, strawberries, apples, blueberries, etc. The possibilities are endless. You can use both heavy cream or whipping cream in this recipe. 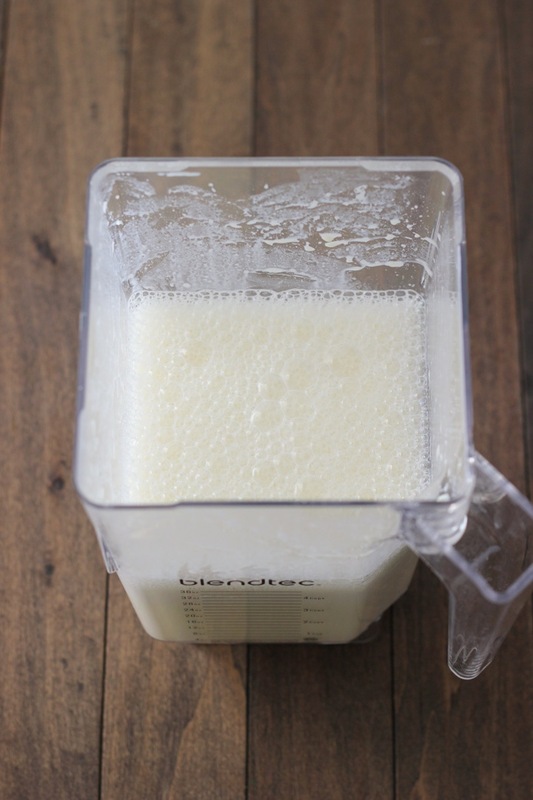 The difference between the two is that heavy cream has a slightly higher butterfat content and whips better. Whipping cream will whip up also, but won’t holds its shape as well as heavy cream. Hello Olga! How do you serve this cake? Do you cut it some how or do you serve it as a whole “log” crepe? I usually cut across the cake and serve it in slices, so everyone gets little circles with cherries inside. I have also served the whole “log” too. It works either way. Hi Olga! 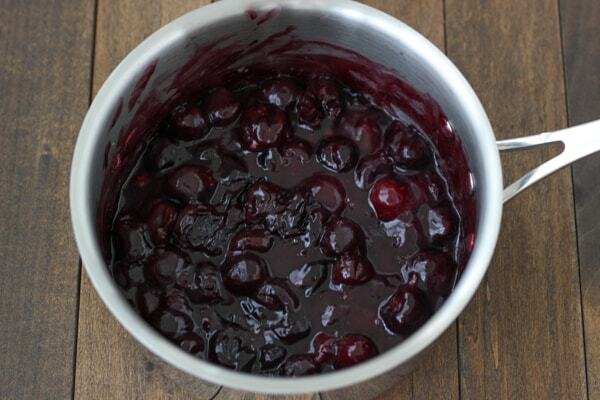 You say that you use Cabernet Sauvignon wine for the cherry filling. Well, I got some yesterday from the wine store. 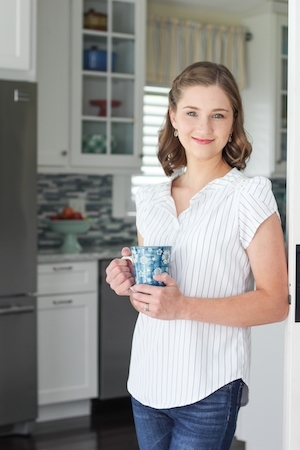 The brand is Sutter Home and it cost around $8. I tasted it and it seemed a bit bitter? Not really sweet? Is this correct? Or was I supposed to get a higher quality of Cabernet Sauvignon wine? Thanks! Cabernet Sauvignon is not sweet. It’s a dry white wine. Don’t worry, the cherries are sweet and you add sugar, so it will definitely be sweet enough. I use this wine for just about everything, including main dishes, and like it the best. Hi, what is the skillet size do you use? 8, 10, or 12? My skillet is 10 inches, but you can use any size. Hi Olga, last question! I promise – lol! I just made this cake and I was wondering if my husband and I don’t finish it by tonight (which we wont) what am I supposed to do with it? Leave it on the container over night or place it in the refrigerator? Thanks a bunch! Hi Oksana. 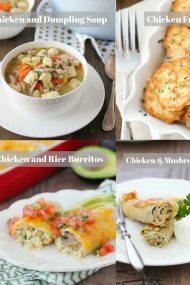 Refrigerate any leftovers:). Yum, I love this cake. 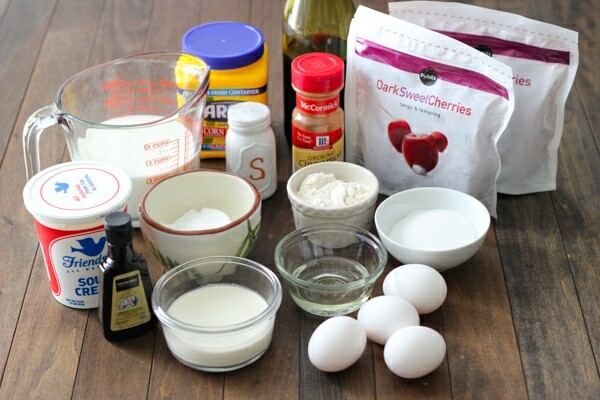 I usually make this cake with the store bought pasty sheets and bake the rolls with the cherries inside. Hey can you let us know how u make yours baked I’m interested . Please? how long do u bake the rolls…i wanna try making it sounds delicious!!!! This looks and sounds amazing! like a lot of your recipes. I am so glad I stumbled on to your site and subscribed. Thanks, and keep doing what you are doing it is greatly appreciated! Thank you, Theresa. I really appreciate your encouraging words! Hi Olga!! !hope you are doing well! love love loove your blog! you are amazing. I was wondering, would it be as good with frozen strawberries or only cherries? I think it will work with strawberries, although the strawberries will be a lot softer in texture than the cherries. Thanks so much, Vikyula! It always makes me so happy to know that others are enjoying our family favorite food. Had a gathering a few days ago and made that cake my first time and it was so good and delicious people were asking me for that recipe. So I told them where to find it. Thank you so much, so happy to try new recipes out from your website. Yay! I’m so happy to hear that, Sabina. Thanks for taking the time to let me know. Hey where can I buy frozen cherrys I went to winco and they didnt have it? I can always find it in the frozen fruit section of the store, but grocery stores are different around the country. Some have certain ingredients all the time and others don’t. does it matter what kind of cherries u use? You can use fresh or frozen cherries, Tanya. Hmmm… I’m not exactly sure what you are referring to. Possible Monastirskaya Izba? I have made this cake for a Russian-themed dinner to coincide with the Winter Olympic Games. It was a very hot and humid night, and we are a very, very long way from anywhere with snow. 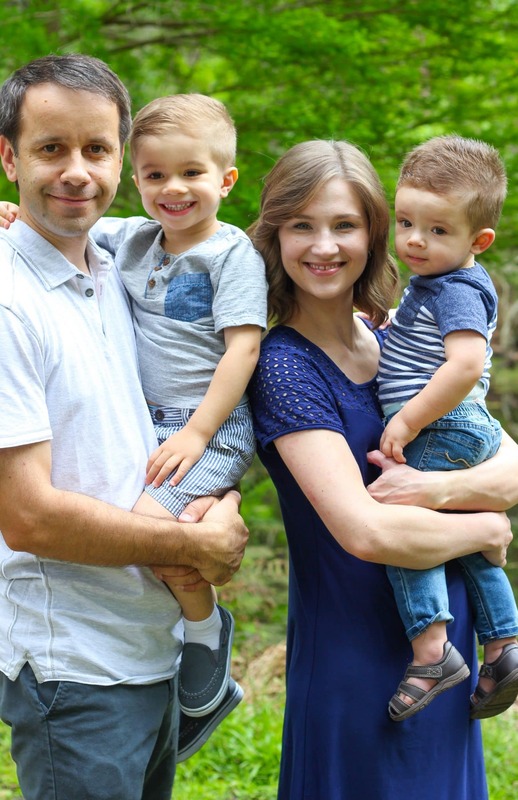 I haven’t seen snow for 20 years and our children have never seen it – but the cake took us to Russia and it was delicious and we had a fabulous time. Thank you! Andrea, Coorparoo, Australia. What a fun memory for your family, Andrea. I’m so glad you enjoyed the recipe. Thank you so much for visiting my blog:). Olga, this cake is ABSOLUTELY AMAZING!!! I made it two times in 4 days!!!!!!!!!! The taste is incredible! Thank you , thank you, thank you!!!!!!!!!! That’s wonderful, Lidiya! I’m so happy that you enjoyed the recipe. You’re very welcome. Do you use red tart cherries or dark sweet cherries? There is a lot of difference in the taste. Living in Michigan – the cherry capitol – I’ll have to try this. Although it’ll have to be in the summer when we won’t mind seeing a little more snow since in the winter we are covered in it! 🙂 Also, I don’t cook with wine but I think I’ll use a little almond extract to give it a little more flavor. I use dark, sweet cherries, but you can definitely use the tart cherries as well, just season with sugar according to the tartness. Enjoy! Can this be assembled the night before and kept ok? I need it for after church on Sunday. Absolutely, Mary. That’s what I usually do. Just make sure to keep most of the liquid from the cherries out of it, or it will leak too much. Thank you so much. I’m looking forward to our international dinner at church Sunday. 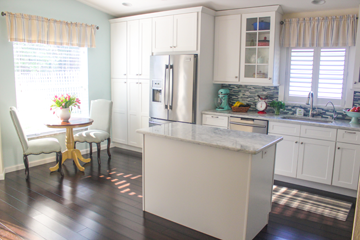 The Russian table is going to have at least 8 recipes from your blog!!! Wow! That’s amazing, Mary. I am so honored. Enjoy your dinner! Wanted you to know what a hit our Russian table was. We had green borsch, black bread, creamy tomato salad, cabbage rolls, beef stroganoff, potato salad, potato pie, beets, firewood under snow, cherry crepe cake, ricotta cheese cake. Most of the recipes came from here and were a great hit. THANK YOU! Do I have to use wine in the cherries? I’m currently pregnant and want to make this for my birthday but do want to avoid all alcohol. There’s only a small amount of wine in this recipe and most of it will be cooked off, but you can just use water or juice if you want. 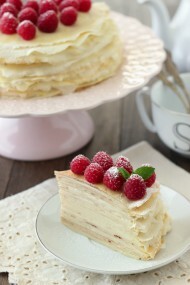 Hi Olechka, can I make the crepe batter and cherry felling the night before and make the actual cake the next day? Olga thank you so much for the recipe. I absolutely love all your recipes. My question is can I freeze or fridge the cherry filling ? And for how long ? You can refrigerate the cherry filling for a few days, Natasha. I have never tired freezing it, although I think it would work.